GardenSMART :: What's Eating Your Tomato Plant? What’s Eating Your Tomato Plant? Tomatoes are the rock stars of the vegetable garden, the most eagerly awaited summer vegetable. However, there are creatures that can get to the plants before you enjoy the first BLT of the season. Here are two of the most common critter problems, and what to do about them. The problem: Where’d all the leaves go? The culprit: Tomato or Tobacco Hornworm. It only takes one of these four-inch green caterpillars with its voracious appetite to defoliate an entire tomato plant, seemingly overnight. 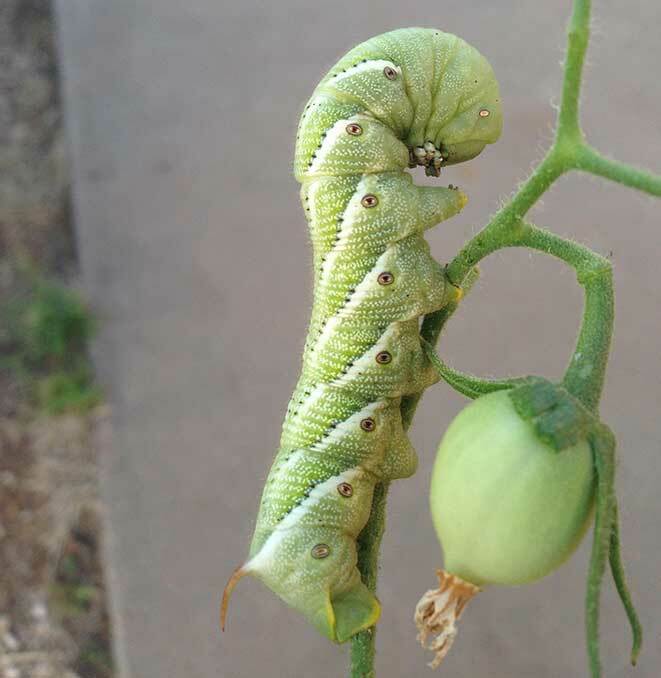 Tomato and tobacco hornworms look alike except for the color of their “horn” – black or blue for tomato hornworm and red for tobacco hornworm. Also consider moving the caterpillar but letting it live. Why? The tomato hornworm (Manduca quinquemaculata) eventually morphs into the sphinx moth, a large moth with a four- to six-inch wingspan and beautiful markings. 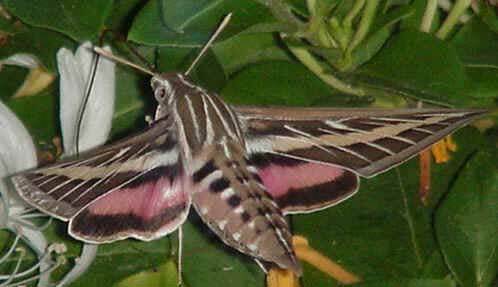 Sphinx moths are often mistaken for hummingbirds, and are also known as hummingbird moths or hawk moths. They pollinate plants, and are food for bats, birds, and small animals. And if you see a tomato hornworm caterpillar with clusters of what look like white eggs on its back, it’s been parasitized by a braconid wasp, and its days are numbered. Remove it from the plant, but put it somewhere in the garden so the wasps can complete their life cycle. The problem: Holes or bites taken out of fruit. The culprit: Birds or animals, likely squirrels, rabbits, opossums, groundhogs or raccoons. The list of creatures that don’t like tomatoes is likely shorter than those that do. It’s disappointing to nurture your tomatoes along to that they’ll-be-ready-to-pick-tomorrow stage, only to find something tasted them before you did. Fences and cages can help protect the plants, as can wrapping netting above, around and below the plants when tomatoes are ripening. Check every day to be sure the netting is secure, and that birds do not become entangled in the net. Also consider that the animals may not be hungry, but thirsty. If practical, put out birdbaths and other sources of fresh water. Keep containers clean and regularly refilled with clean water.